Though the administration has begun building out this aspect of its Asia strategy, much more remains to be done. On July 30, U.S. Secretary of State Michael R. Pompeo delivered a much-anticipated address at the U.S. Chamber of Commerce outlining the emerging economic vision for the Trump administration’s new Free and Open Indo-Pacific Strategy (FOIP). While the remarks signaled the administration’s commitment to building out the economic aspect of its Asia strategy, it also spotlighted the significant challenges it confronts as it attempts to follow through on it in the coming months. While the United States has long been a significant economic player in the Asia-Pacific, U.S. policymakers have also long contended with the problem of how to engage economically with the region relative to other key players. Part of this is due to a range of structural challenges, including the way in which economic policy works within the U.S. government, the high standards that Washington expects relative to the lower ones present in much of the region, and the sheer budget constraints present relative to the active engagement of American companies. Both the George W. Bush and Barack Obama administrations tried to contend with several of these challenges, including by moving towards bilateral and multilateral free trade agreements and fashioning various initiatives to coordinate, focus, and, with the Trans-Pacific Partnership (TPP) only being one example of this. But they too faced difficulties in doing so as well amid the confluence of several trends, including the increasing regional demand for infrastructure and China’s growing economic prowess. The Trump administration is now confronting the same general challenge with respect to its FOIP strategy, albeit with its own particularities. As I have noted previously in these pages, since its conception, one of the chief concerns in the region with respect to FOIP has been that it may be a narrow, security-focused initiative rather than a comprehensive one with a robust economic component, despite some regional states’ longstanding calls for greater investment in this realm by Washington (See: “Trump’s Indo-Pacific Strategy Challenge in the Spotlight at the 2018 Shangri-La Dialogue“). And while some aspects of these challenge are rooted in the aforementioned structural ones, there are also others that are more specific to this administration, including Trump’s own protectionist actions such as the withdrawal from TPP. Though the administration has long been cognizant of this and we had already begun to see the elements of an emerging U.S. economic approach, Pompeo’s announcement served as the clearest and most comprehensive set of remarks by the administration on its economic vision for the Indo-Pacific to date. And to the administration’s credit, the address did hit several key notes, including explaining the value add of U.S. economic engagement, pledging specific, albeit modest, initial dollar amount of $113 million tied to priority areas such as cybersecurity, energy, and infrastructure, and emphasizing the importance of ASEAN-led multilateral institutions. Yet despite this promise, the administration faces significant challenges that lie before it. Part of this is the longstanding issue of managing misunderstanding in the region about how U.S. economic policy works relative to other actors or other initiatives like China’s Belt and Road Initiative (BRI), which still exists as evidenced by the fixation on dollar amounts and misguided comparisons to Beijing following Pompeo’s remarks (See: “The Real Trouble with China’s Belt and Road Initiative“). But there are other aspects of this that lie closer to home, from ensuring that the individual sector-specific initiatives announced actually sustain over time rather than fading away as some of their predecessors have in the past, to managing the fallout from Trump’s own protectionist tendencies even as this regional approach takes shape. Though Pompeo attempted to provide some reassurance on this front in his remarks, addressing regional skepticism will likely take some additional time and effort. 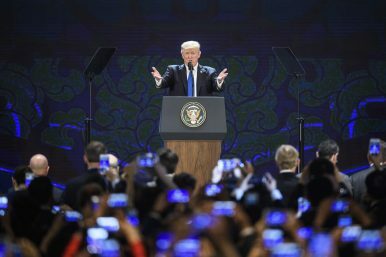 Laying out, implementing, and sustaining a clear, consistent, and credible economic approach to Asia has been a challenge for several U.S administrations, and Trump has only added to that challenge that his administration faces with some of his early actions. While Pompeo’s address suggests that the U.S. government recognizes the importance of building out the economic aspect of its FOIP strategy early on, the next few months will be a test of its ability to actually follow through on this amid the full range of domestic, regional, and global issues that it confronts.